L-R: The Hound and Ray. In its latest episode, Game of Thrones carved the heart out of one of its central story lines. When “The Broken Man” revealed that Sandor “The Hound” Clegane had put down his sword and taken up with a religious community in the Riverlands, it was echoing a passage from A Feast for Crows, the fourth volume in author George R.R. Martin’s epic-fantasy saga A Song of Ice and Fire. But in that echo, something sounded very different. The antiwar monologue known as “the broken man speech” that made this section of the books so crucial to understanding the whole series was removed and replaced, with a much darker outcome for its participants. And that change demands special scrutiny. The relevant segment of the novel centers not on a man of the cloth named Ray, the newly created character played by Deadwood veteran Ian McShane, but on a character called Septon Meribald who holds a very similar function in the story. He’s a prominent figure on the Quiet Isle, an isolated community of priests and monks who’ve mostly taken a vow of silence and who aid the poverty-stricken people of the war-torn region. It’s here that the Hound washes up, though in the books his presence is only heavily implied rather than shown outright. In the meantime, Meribald encounters Brienne and her sidekick, Podrick Payne. As opposed to the show, where Maid of Tarth and her squire have encountered both Stark sisters, rescued one of them, and even delivered justice to Stannis Baratheon, they spend the book wandering aimlessly, and increasingly hopelessly, through the wreckage left behind by the War of the Five Kings. After hooking up with a disreputable knight named Ser Hyle Hunt in their search for Sansa and Arya, they join Meribald during his wandering route through the villages and countryside and strike up a conversation about “broken men”— the rogue ex-soldiers who’ve either deserted or been deserted by the forces they once fought with and now roam the land, often wreaking havoc on unwary travelers or defenseless peasants in their search for food, money, and shelter. It’s a powerful, beautiful passage, marked by some of Martin’s finest prose, and his most heartfelt denunciation of war’s horror. While not a pacifist per se, Martin was a conscientious objector during Vietnam, and his injection of convincing misery and atrocity into the rousing battle sequences of the epic-fantasy genre is a big part of what made A Song of Ice and Fire such a critical success, as well as a vital corrective to the gleaming, glorified version of violence that previously characterized much of the field. But it’s the Hound’s reply — “You don’t cure it by dying, either” — that appears to win the argument, in gruesome fashion. While the one-time killing machine is out chopping wood, his friend and his flock are massacred en masse. Ray is left hanging from the eaves of the house of worship the Hound was helping to build, his goggle-eyed face mirroring those of the traitors Jon Snow hanged earlier in the season. 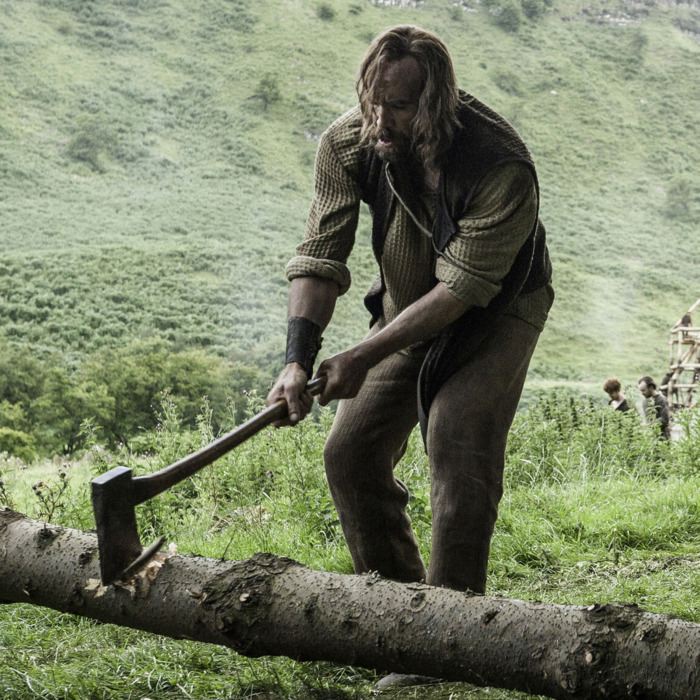 The episode’s final shot shows Clegane grabbing an axe, no doubt intending to chop something other than wood this time. “It’s never too late to come back,” the salt-of-the-earth holy man had told his towering follower, encouraging him to put killing aside. Apparently, he was wrong. Now, you don’t need to believe that Game of Thrones is cynical to agree with the idea that its world is a harsh one; the argument in its favor is that, well, so is our own, and if you don’t believe that, there’s a drone war in Yemen that demands your attention, just for starters. Moreover, there’s a danger in engaging art through a morally prescriptive lens. If we insist upon optimism, if we demand amoral or immoral behavior constantly be labeled as such with big block letters, we’re asking for art that lets us off the hook — a Goofus and Gallant world where we can coast on “Who, me? I would never!” Such simplification of complicated ideas does more of a disservice to social justice than the art its practitioners often decry. But Weiss’s contention that the Hound has been “given no real choice” is key, and depends largely on the visual and emotional context of the scene. Sandor Clegane could well decide that the deaths of Ray and his followers demand his brand of pacifism be honored as a response, but the episode leaves little gut-level wiggle room for that. The slaughter is so total, Ray’s murder so grisly in its symbolic irony (again, they hanged the guy from his own church), that he looks not like a martyr to an ideal but an insouciant fool. When accompanied by the Hound’s decision to become a man of violence once again, this sets up a disturbing, though possibly unintentional, moral continuity: In a world where pacifism gets everyone killed, then killing them before they can kill you and yours is the only ethical position. If this dynamic seems familiar, congratulations: You’ve been watching The Walking Dead and its Fear the Walking Dead spinoff. On these shows, the misadventures of Rick Grimes, Madison Clark, and their respective bands of friends, family, and allies consistently present the characters with a false binary: Peaceful, conciliatory conduct inevitably leads to torture and death, while greeting all newcomers with near fascistic suspicion and lethal hostility is the only means of survival. The problem isn’t that these shows take place in and portray a world of brutal violence; that’s a perfectly valid artistic choice, given the genre (though it’s by no means the only possible choice, and zombie horror is a weaker field due to practitioners and audiences who insist that it is). The problem is that the alternative is always shown to be foolhardy — naive, stupid, all but a sign that you deserve to fall victim to the brutality of others. This makes brutality meted out in kind the only justifiable moral position; to put it in the vernacular of Donald Trump’s tribalism, which shares its cynical exploitation of fear of outsiders, deal from strength or get crushed every time. The fate of Ray and the Hound’s relapse into violence appear to create a similarly rigged closed system. But there’s more to the episode than just one sequence, and more context than just the relevant passage in the books. Much else in “The Broken Man” mitigates the apparent justification of vengeance and violence that the Hound’s hand on that axe suggests. There’s the loathsome behavior of House Frey, the architects of the Red Wedding, currently tormenting their captive Edmure Tully in a fruitless bid to retake the castle they stole. There’s the obstinance of their enemy, Brynden “the Blackfish” Tully, promising to fight on to the last man in order to die in the home where he was born and raised — a pointless squandering of human life for a lost cause, as Jaime Lannister, of all people, points out to him. There’s Cersei Lannister’s similarly single-minded vendetta against the High Sparrow and all her other enemies despite having soundly lost her struggle for power — a vendetta that seems likely to unleash the Hound’s monstrous brother, a zombified Gregor “The Mountain” Clegane, upon the hapless people of King’s Landing. And most importantly, there’s Ser Davos Seaworth’s speech to little Lady Lyanna Mormont, who’s reluctant to send more Mormont men to fight and die on the Starks’ behalf: “The real war isn’t between a few squabbling houses. It’s between the living and the dead. And make no mistake, my lady: The dead are coming.” As this speech makes clear, the White Walkers are the antiwar metaphor that drives both the books and the show alike. The game of thrones, the bloody battle for political power, is nothing but a wasteful, immoral sideshow. Only our common humanity matters. Surely it’s no coincidence that Davos spells out this theme in the same season that has seen the most bloody-minded and batshit people in Westeros take over kingdom after kingdom: vengeful Ellaria Sand and her Sand Snakes’ toppling of House Martell in Dorne, Ramsay Bolton’s murder of his already awful father and assumption of power in the North, madman Euron Greyjoy’s ascension to King of the Iron Islands, religious fanatic the High Sparrow’s control of King’s Landing. When these shortsighted creeps grab their proverbial axes and swing at the heads of their enemies, they’re committing a crime not just against those specific people, but against all living things, since war between Houses or faiths plays right into the White Walkers’ cold hands. So when we consider the show and the book’s treatment of this plotline, it’s worth resisting the instinct to pit the two approaches against each other. Snap judgments do a disservice to the challenging, upsetting, and ultimately rewarding themes that Game of Thrones has chosen to tackle. Yes, while it’s difficult for even the biggest skeptic of the “but this is different!” book-to-show style of criticism to resist an apples-to-apples comparison, there are whole orchards to consider. Why’d Game of Thrones’ Antiwar Speech Change?